Due to advancements in technology, we can now use so many wireless devices. This wireless technology has been extended to doorbells and this is a great feature that homeowners can take advantage of. Now you won’t have to tackle complicated wiring when it comes to doorbells because we have improved wireless models on the market, including those designed for specific requirements, like the hearing impaired doorbell, with loud chimes and a flashing alert. One example of this type of system is the SadoTech Model C Waterproof Wireless Doorbell. 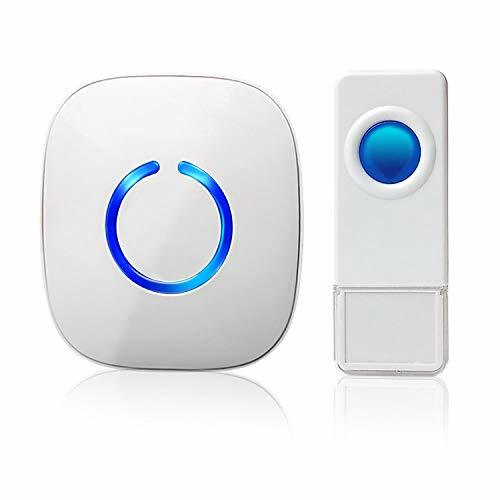 If you are looking for a wireless doorbell, you can check this one out and see if it fits your needs. Operating range of over 500 feet. (1000 feet in open area). Remote transmitter button is rated IP68 weatherproof and acceptable for outdoor use. Wireless doorbells are systems for homeowners who want a minimal, easy-to-use alert device. The SadoTech Model C Waterproof Wireless Doorbell is a model which is quite user friendly that even beginners will easily mount the unit. The model has a transmitter button with an IP68 waterproof rating which means you can use it outside the house. The unit has an operating range of more than 500 ft. and it can also operate within a thousand feet whenever it is used in open areas. The unit comes with a selection of more than 50 ring tones so you can easily choose the chime you prefer. The volume can be adjusted from 25-110 dB, so if you have babies or elderly people inside the house, you can effortlessly adjust the volume during rest hours. The setup is pretty easy to tackle. You merely plug in the receiver, position it in a spot that has an outlet, and you can move it from one place to another, just as long as there is an outlet available. The transmitter button that the unit comes with uses a battery, which is included in the package. It fastens to the wall or door post by means of double-sided tape, or you can choose to fasten it to the house’s exteriors by means of the screws. The unit as mentioned is easy to install, which is one of its chief benefits. You don’t have to deal with wires. The button illuminates whenever it is pushed and the volume control that the unit comes with works decently. Even when the house is on the noisy side, you can still hear the doorbell whenever it buzzes or chimes. Another great thing about the model is that it comes with a waterproof outside button, which is great for those who also want to take advantage of a wireless unit outside the door. The indoor ringer simply takes a single outlet. Furthermore, the company has excellent customer service. Make inquiries and they will be happy to accommodate and answer your questions about their products. The brand also offers a website that is packed with information including videos that show consumers how to install and use their doorbell. Simply put, this is a product that works well and quite worthy of checking out. To be rather honest about this review, the SadoTech Model C Waterproof Wireless Doorbell, despite its positive points, did display a few drawbacks. One flaw is that as soon as you choose the ring tone that you want, the ring tone or chime will not sustain the selection if the power is not linked up from the receiver. This can be annoying since this means in case of power outages, you have to reset your ring tone selection again. Also, it would be good if the company decides to use AAA batteries to operate with the unit instead of those button batteries. All in all, this SadoTech Model C Waterproof Wireless Doorbell is a decent product. It was highly functional and it works great despite some minor negatives. They are easy to install, have a nice set of adjustable volumes and ringtones, plus the transmitter button is waterproof so you can use it outside. Altogether a solid product at a great price point.